My dislike of Chipotle is well documented, but I have also been quoted as saying “Free Chipotle is the only good Chipotle“. Thanks to Gen from Foodies R Goodies for passing along this information: on Friday from 6 p.m. to closing every single Chipotle in New York City will be giving away free burritos to anybody dressed up… as a burrito (or a taco). We’re not sure about some of the existential issues involved (i.e. how serious does your burrito costume have to be, or will the free burritos include free “$1.75 guacamole”) but we’re guessing they’ll be good sports about it. 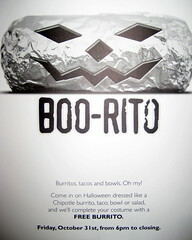 Especially if you’re enough of a loser to spend all day at work dressed as a burrito for what amounts to $7. Posted by Zach Brooks at 4:19 pm, October 27th, 2008 under Chipotle. You’re wrong about Chipotle, it’s the best burrito around, for sure. Zach, you posted about the new Chipotle location during the summer…guess it is months behind schedule. For me, I’ll pass on Chipotle…as well as Baja Fresh. Not impressed with either. i don’t mix up chipotle with authentic mexican cuisine, but as much as you hate on it, i love the cilantro lime rice and the veggie burrito bowl is quite a deal! yeah my friends and i used to do this in high school – it doesn’t have to be serious, usually we’d take a roll of tin foil, wrap it around us once or twice and head into chipotle for the free burrito. I’m homeless and crazy. I actually think I’m a burrito and dress accordingly. I’ll be hitting several spots for my free meals. Viva Chipotle! So Marcos, it’s you who’s been shitting in the jalapeno patch! Fundraiser for Stone Barns Center. Wed. Oct 29, 5 to 9 pm. $5 donation will get you various Chipolte fare. 100% of the proceeds will benefit Stone Barns Center for Food and Agriculture in Pocantico Hills, NY. Below is the link for more info. whooo, back it up.. stone barns, like blue hill at stone barns, that stone barns, has hooked up with chipotle? what would alice waters say about this? @mike: thanx for the heads-up on this. only a couple of people ahead of me at 5:30 for this. $5 for a lot of food and a good cause. win-win. I’m confused Mike, what does Jipotle have to do with blue smoke?? what the hells going on here… what am I doing reading this damn blog this late?? ?